LOS ANGELES — If you’re a sports fan, it would be nearly impossible not to have been enormously entertained by the thrilling Rose Bowl game between Penn State and USC. 2. Regardless of how entertaining the contest was, you’re upset that Penn State actually blew a game it certainly should have won, up by two touchdowns in the fourth quarter. Both perspectives are certainly understandable, and a lot of people may be somewhere in the middle. From this view, the game was a blast. But then again, I’m not a fan and didn’t spend thousands of dollars of my own money to fly cross country to see my team stage a great comeback, only to squander the game away late. n I have absolutely no problem with PSU being aggressive and trying to win the game after taking possession in the final minute. USC was playing something close to a home game, it had all the momentum after storming back, and it has a fantastic quarterback in Sam Darnold who was red hot. If the game would have gone to OT, I’m convinced the Trojans would have won. n OK, so many of you don’t like that Trace McSorley threw the ball deep on second and third downs on PSU’s final possession. He just barely didn’t get enough on the second-down throw to Mike Gesicki, the ball hung up in the air a long time, and it was knocked away. It looked like Gesicki could have been more aggressive in going up to get the ball, instead of waiting back for it. On third down, McSorley made a mistake. A big mistake. He admitted after the game that he made a bad read, locked in on one receiver and tried to force the ball to Chris Godwin, who had a sensational game. For those of you who think McSorley never should have been throwing the ball, let alone throwing it deep, I’m just not sure you understand the Lions’ offensive philosophy. They are going to be ultra aggressive under Joe Moorhead, taking as many shots downfield as they can. That is what got Penn State to the Rose Bowl. Yes, it’s also what ultimately lost the Rose Bowl with McSorley throwing the interception, but again, the mistake wasn’t the scheme or the aggressiveness by Moorhead, it was that McSorley made the wrong football play. And he owned up to it. n On Penn State’s next-to-last possession, leading 49-42, it could have iced the game with a first down and USC holding only one timeout with two minutes left. On third-and-4, Moorhead’s playcall was too conservative. He wanted to eat up clock, so Moorhead called for a handoff to Saquon Barkley, who was stuffed for a 7-yard loss. The Lions could have won the game on that play, and having McSorley on a run-pass option with a chance to take off or toss a short, safe pass to Barkley or Godwin or Gesicki might have done the trick. n What I’ve just presented is why it’s hard to be a coach. You get second-guessed for almost everything. I love Moorhead as a playcaller, and I’ll defend him being aggressive any time. Yet, with a chance to win on third-and-4, the call was too conservative. 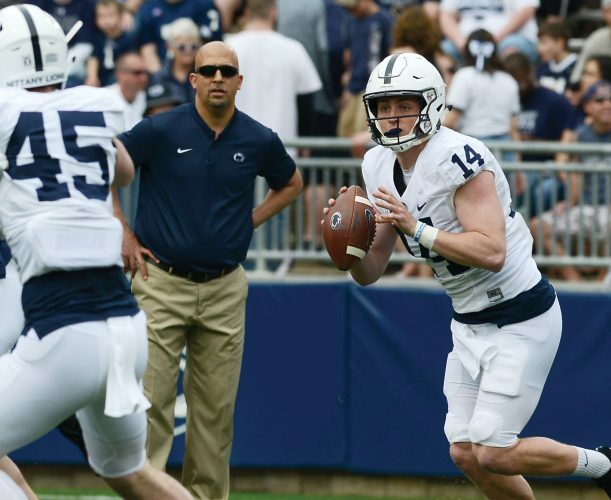 n Penn State was sensational at coming back this season, but oddly enough, the Lions didn’t seem to know how to play well with the lead against an opponent that was able to withstand what looked like several knockout blows. 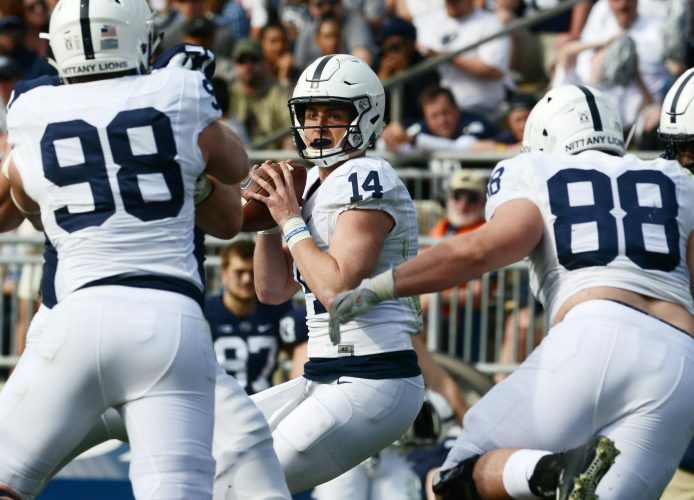 When Penn State came back to take leads against Ohio State, Indiana and Wisconsin, those teams looked to be shellshocked and couldn’t recover. Which is understandable. When USC did recover, this time Penn State had no answer, and it ultimately was left with trying to regain momentum. The Lions just weren’t able to steal it back. n The way Godwin played on such a huge stage, don’t be surprised if the junior turns pro early. He’s definitely an NFL receiver, although I’m not sure he will go until at least the third round. If he does leave early, Godwin will need to put up good numbers at the NFL combine to impress scouts. His 40 time and vertical jump will be key measurables, but there’s no doubt he’s excellent at catching everything thrown his way. n Lane Kiffin is such a giant goof that he actually got fired — which appears to me to be what happened — from a job that he was already set to leave as Alabama’s offensive coordinator. It’s hard to see any major program ever giving that guy another shot as head coach. n Tracy Claeys did a nice job at Minnesota, and it surprised some that he was fired Tuesday. But Claeys made a terrible blunder backing his players when they boycotted during a messy sexual assault scandal at Minnesota. It’s the coach’s first instinct to stand behind his guys, but in this case, Claeys should have shown more sensitivity. Something bad happened at Minnesota, and we will never fully know what it was. But don’t kid yourself into thinking that nothing really happened just because charges weren’t filed.